Jeffrey Dahmer is one of the most infamous serial killers of all time and serial killers in popular culture have always generated a degree of morbid interest, whether they are real or fictionalised. ‘My Friend Dahmer’ takes a slightly different slant to anything I’ve seen in this genre before, focusing in on Dahmer’s life as a teenager, before he’d started on his killing spree. 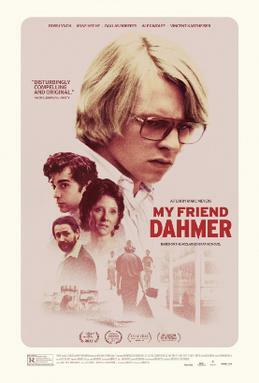 Based on a graphic novel from one of his former classmates, John ‘Derf’ Backderf, ‘My Friend Dahmer’ is an odd little film that attempts to tell the story of how a young man turned into a monster and it certainly made an impression on me. Ross Lynch, who has previously made a name for himself on kid friendly Disney shows, plays Dahmer here and his uneasy performance encapsulates a boy who doesn’t quite fit in. Knowing what Dahmer would become makes it difficult to empathise with the character and the film takes a curious approach that almost wills the audience to feel sorry for him, portraying him as an outsider with no friends. I was a little uncomfortable with this approach primarily because the film never makes any statements deeper than, ‘look at this crazy kid’, and the knowledge of what he’d become makes it particularly troubling to watch (which is perhaps the intention). The film does a good job of balancing relatively normal teenage hijinks with Dahmer’s unsettling behaviour, and some of the strongest moments come when the group of kids Dahmer hangs around with are carrying on and it becoming clear that even in this context, this kid takes things a little too far and is a little too weird. ‘My Friend Dahmer’ is a well acted drama that provides an insight into the infamous serial killer in his younger days, and whilst the script may be a little too self satisfied at times, this is an unsettling watch and will intrigue anyone with an interest in this genre.